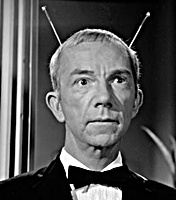 Ray Walston as “Uncle Martin”, Martian name – Exigius 12½. It was about a man from the planet Mars who became stranded on Earth after his spacecraft crashed. 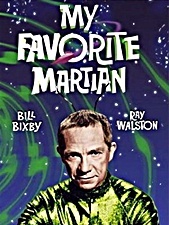 An Earthling named Tim O’Hara took the friendly Martian into his home and allowed him to pose as his Uncle Martin. Uncle Martin looked just like any other Earthling except for his antennae which were usually hidden inside his forehead. When he extended the antennae he could disappear. 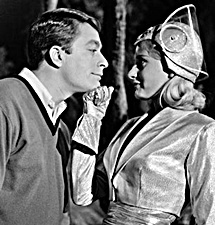 My favorite Martian was created at a time when ordinary family sitcoms needed a little kick. In the same vain as I Dream of Jeannie and Bewitched, the story revolved around someone who possessed greater than human powers living among us normal folk. The use of those other worldly powers often created some very comical situations. In the case of Uncle Martin he just wants to fix his broken spaceship (it had crashed near Tim’s apartment) and get home to Mars. The situations got a little more far fetched as ratings went down in the second season and MGM picked up the show. Both Uncle Martin and Tim lived in a garage apartment above Mrs. Brown’s home. Uncle Martin and Mrs. Brown always had some romantic intentions but it never grew into anything. Mrs. Browns house got three different addresses during the show. In season one, Tim says his address is 1436 Greenhill Road, in Season two, the address shows as 347 Palm Court and in the last season the address changes to 21 Elm street. There is no official explanation for this. 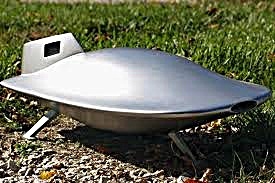 The spaceship design was based on a 1962 e-type Jaguar at least the hood and grill of one. 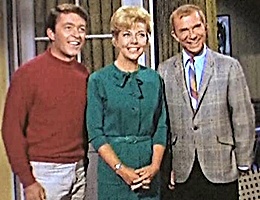 Both Bill Bixby and Ray Walston were members of a professional magicians club in Hollywood CA. During his audition for the show Bill Bixby said to the Producer, “Hello, I’m Bill Bixby”. The Producer replied, “No, you’re not. You’re Tim O’Hara”. The writers for the show included a total of 8 women which was almost unheard of at that time.